Student enrollments in online learning continue to increase but are very concentrated in public institutions and large private universities. Left out in the cold — and seemingly content to remain there — are the smaller private institutions. However, it is becoming increasingly perilous for small colleges to ignore this trend. Many small colleges are facing student shortages that are leading to closings. Moody’s predicted in 2015 that small-college closures would triple if the institutions could not raise additional revenues. Online learning offers a viable solution. There are two distinct advantages to small schools implementing online learning programs: increased student diversity and tighter control of educational standards. Online education is a means of reaching a more diverse student population, an advantage most colleges find highly desirable. In a statement released back in 2012, the American Council of Education highlighted the importance of diversity in higher education. Diversity enriches the educational experience. Diversity promotes personal growth and a healthy society. Diversity strengthens communities and the workplace. Diversity enhances America’s economic competitiveness. Small schools with online programs position themselves to capitalize on these advantages of a diverse student population. And they can do so without the expenses and physical constraints that come with offline programs. Another advantage of online programs is the school’s ability to control the quality and value of their degrees. EdSurge noted that private colleges are increasingly concerned about the credits students earn when they enroll in online courses at other institutions during summer and semester breaks. These outside courses may not reflect the same high educational standards held by the student’s primary institution. However, by deploying their own online programs, these concerned schools avoid diluting the value of the degrees they offer. Small colleges take pride in providing these personal relations to students, and online learning can seem to be the antithesis of this mission. Read how ExtensionEngine built Notre Dame an online learning system with small class sizes, faculty interaction, and student collaboration. As a result, when a private college launches an online learning program, they have to own it. Their programs have to reflect the college’s educational standards, their pedagogy, their community, and their unique character. That requires a considerable investment, and they need to be as committed to making that investment as they are when they construct a new classroom building, library, or dorm. Fortunately, there are proven strategies to overcome both of these impediments. Many of my conversations are with folks from smaller colleges that have traditionally focused on their residential liberal arts programs. While there is more commitment to moving online than in previous years, there is still considerable resistance, particularly among the faculty. Such resistance is almost inevitable. These faculty members have traditionally prided themselves on the personal connections they forge with students. They enjoy teaching with pedagogical approaches that are both engaging and challenging. They see online learning as failing to deliver on these points. And they’re not completely wrong. Much of online learning is of the cookie-cutter variety that uses a “tell and test” pedagogy these gifted teachers find greatly lacking (“I hate MOOCs!”). However, that’s also not the only approach available for online learning programs. In fact, at ExtensionEngine, we build custom learning experiences that take advantage of the personal approach found at smaller schools. What types of pedagogy do you employ? What student interactions do you foster? What kind of community do you create semester after semester? Second, our online team works with faculty and staff to gain an understanding of why their programs exist within the context of the larger institution. The goal is to uncover the motivations and concerns of the stakeholders at the heart of each program within the college. Gathering this information enables the school’s leadership to assure faculty that the joy they get from teaching won’t be lost by moving online. As evidence, they can bring to the faculty’s attention some of the more recent advances in online learning pedagogy that capture the best of what happens in a small classroom. Read this case study to learn how Notre Dame's program focuses on developing a close student-faculty bond that brings a personal approach to online learning. The size of small colleges often creates a financial barrier to building the right kind of online program - one that would faithfully represent their educational commitment to their students. This is not something that can be done on a shoestring. Many larger institutions offset this cost by engaging an online program manager (OPM) to develop the offering. In this arrangement, OPMs provide most of the up-front investment in return for a significant share of the revenue. However, working with smaller programs and smaller schools is less than ideal for OPMs. For OPMs, a higher volume of enrollments means more revenue. Fewer enrollments means less revenue and a longer payback period, not to mention a longer road to turn a lucrative profit. Plus, the OPMs generally produce those cookie-cutter courses that faculty rightfully find so problematic. The other obvious path forward for small schools is DIY: do it yourself. The difficulty here is finding, building, and maintaining the in-house staff needed to create and support such programs. Furthermore, faculty members with the expertise and insight needed to be leaders of online learning are generally in short supply. Small schools without an online learning platform don’t tend to attract these types of faculty leaders. So what’s the solution? Get outside help, but without sharing revenue. 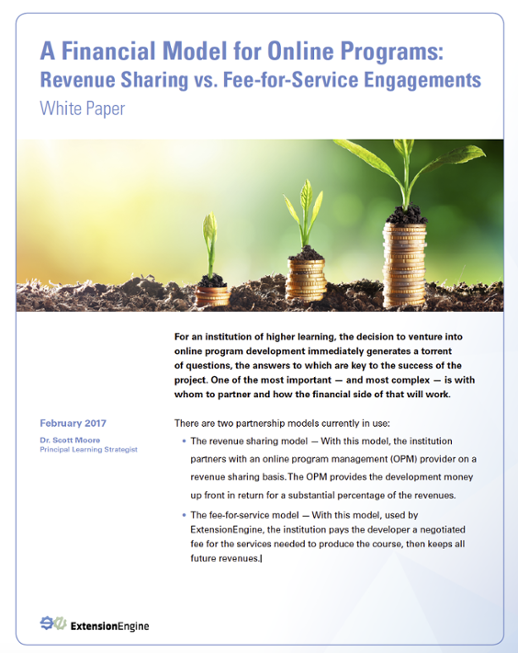 A perfect solution many small colleges are not even aware of is to work with a fee-for-service partner without a revenue-sharing contract. With this arrangement, the school pays to design the learning experience and delivery platform while still retaining full ownership of the platform itself - just like constructing a new campus building. This enables an institution to begin work with a knowledgeable, accomplished team. This team will slowly transfer skills and expertise to the college’s team as the engagement proceeds. Eventually, the institution takes full ownership of their program, or at least the amount of ownership that they want to take. Certainly, this approach takes an up-front investment — many of our clients have either received a gift or taken money out of their endowment. It’s the same making any other significant investment in the school’s future — but the institution gets to keep all of the revenue from enrollments. Over time, the school comes out far ahead. Learn more by watching this webinar: Building Online Programs Without Revenue Sharing Online Program Managers (OPMs). If the above speaks to you, your next step is very easy: set up a 30-minute meeting with me. We’ll talk about the specific challenges your institution faces. Because I know how long the purchase cycle is in higher ed, you’ll find that I’m completely in “informing mode” rather than “selling mode.” I sincerely want to help you find the best path forward, whether it involves ExtensionEngine or not. Consider it a half hour of free consulting with an expert in the field. If there seems to be an organizational fit and the timing is right, we’ll dive into a financial model I’ve built to gain a realistic view of your venture into online learning. The model will give you more insight into the personnel and financial resources you will need to have at your disposal. But for now, set up that meeting. Learn about the advantages and disadvantages of each engagement model, which one is best suited for your institution, and how you can receive a custom-tailored financial model for your institution.